This afternoon, HubSpot announced Social Inbox, a new suite of tools -- and part of HubSpot's Inbound Marketing offering -- that aims to bring the human element back to social media. Joe Chernov, current VP of Marketing at Kinvey and former CMO of Eloqua (somewhat of a competitor to HubSpot), was in attendance at this afternoon's launch and tweeted, "Conclusion: @HubSpot Social Inbox is what Radian6 should be." Conclusion: @hubspot Social Inbox is what Radian6 should be. Describing Social Inbox in a blog post, HubSpot CMO Mike Volpe wrote, "With Social Inbox, HubSpot takes your contacts database of leads, opportunities, and customers, and merges it with your social media interactions. So when you get a tweet from someone, you know if they are a customer or a lead. And when you know who someone is, you can treat them the way you should be treating them." In a nutshell, HubSpot Social Inbox connects prospects, leads and customers to their social media activity -- as well as where they are in the sales funnel -- and paints a more robust picture of that person and their needs so when a brand interacts, it's more relevant and more human. The video below describes the offering in more detail and why HubSpot thinks it's time to bring the social back to social media. HubSpot CEO Brian Halligan had this to add, "The promise of HubSpot was always the notion that customers expect and deserve more lovable marketing. Over the last five years, social media marketing has been far from lovable; in fact, brands were typically using social media to push out contests, sweepstakes, and promotional content--tactics that are impersonal for customers and ineffective for marketers. 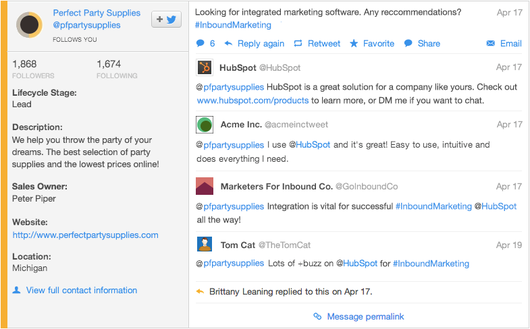 HubSpot Social Inbox allows marketers to create, share, promote, monitor, respond, and integrate social media into their overall marketing approach. Social Inbox is a powerful vehicle for marketers that results in a singular narrative for customers." 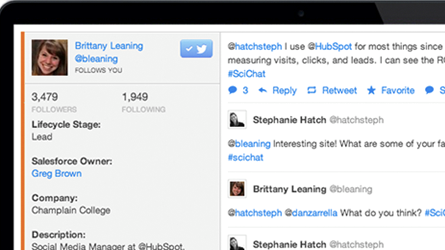 HubSpot Social Inbox will roll out to customers in early June.